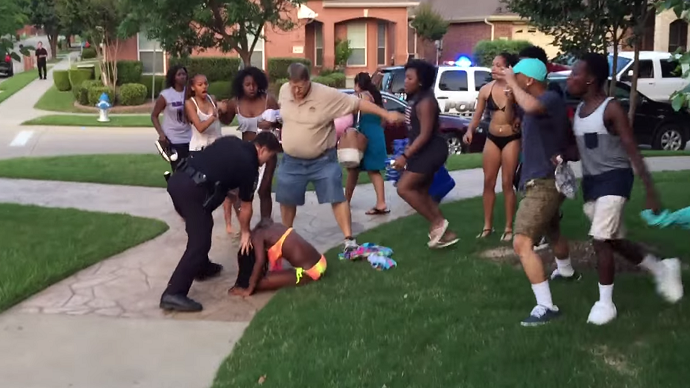 A McKinney, Texas police officer has been suspended after a clip went viral showing him throwing a black bikini-clad teenager to the ground and chasing her friends with a gun. Police were called in because of “too many black teens” partying in the area. A video filmed on June 5 and posted on YouTube by Brandon Brooks has scored hundreds of thousands of views, causing a wave of online outrage. It shows McKinney police officers forcing a group of black teenagers dressed in sportswear and bathing suits to the ground, and chasing those who do not comply with what look like flashlights or Tasers. They also swear at the kids. One particularly aggressive officer is seen dispersing a group of girls, shouting “I don’t care, you’re leaving now.” Moments later he is seen walking up to and detaining a black female teen who is reluctant to leave immediately. Then, all of a sudden, the cop throws the bikini-clad girl to the ground. When other girls run to the scene, he violently pushes them away before producing a gun and briefly chasing two of the black teens. He then returns to the girl, forces her face down, and sits on her back to handcuff her. The teenager repeatedly cries “Oh my momma, oh God!” and bursts into tears. The officer has been identified by local media as Eric Casebolt, although the McKinney Police Department did not immediately disclose his name. The department, however, said that an officer had been placed on administrative leave following the incident. An investigation has also been launched. According to Boston, officers “encountered a large crowd that refused to comply with police commands” and were given additional reinforcement. Police have been accused of racial prejudice in the incident, as officers appeared to be picky about which of the 70 teens of different ethnicities they forcefully detained.